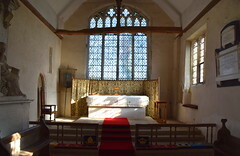 Given its proximity to the Cambridgeshire border, some people would argue that this Suffolk church is closer to civilisation than most, and yet St Margaret of Antioch, Cowlinge, has a decidedly remote feel to it. Gentle hills enfold these pretty villages, and St Margaret stands distant from the houses it serves. 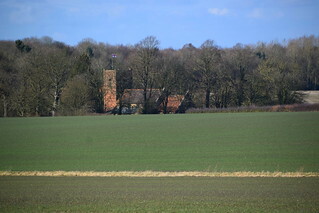 Cowlinge, pronounced coo-linj, stands about a mile north of the Haverhill to Bury road, not far from the better-known villages and medieval churches at Denston and Lidgate. You approach St Margaret up a track from the north, where it is rather hemmed in, but the graveyard opens up widely beyond on the other side. The first impression is one of redness. From the outside, Cowlinge seems a rather pretty accretion of centuries' work, its tower a typical red brick 18th century rebuilding - there are similar ones across the county at Grundisburgh and Layham. The west doorway is oddly grand for such an out-of-the-way spot. The high eastern gable shows that the chancel roof was once thatched, while the chancel and nave appear to have met each other by chance as much as intention. All is pleasantly patched up, with solid red-brick buttressing and just about every kind of window you can think of. There are aisles, there is a clerestory, but this is not a grand church. Rather, it is the kind of building a DIY enthusiast might put together if he wanted a late medieval one in his back garden. And somehow, this makes it beautiful, especially if seen from the south-east or north-east. You might expect the interior to be similarly ramshackle, but you step through the north door into cool whiteness, and as you walk through this treasure chest of a church, unusual vistas open up at each turn. This is a complex church. 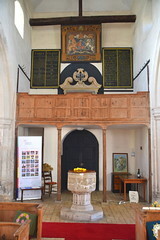 Facing east to start with, the first impression is of the wall-painting above the chancel arch, and the gated rood screen beneath. 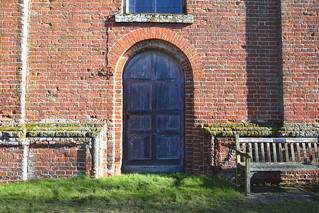 There are gates in the screens at nearby Withersfield and Denston, but unlike those these doors rise to the full height of the screen. The screen itself is perhaps not as beautiful as the parclose screen enclosing the chapel in the south aisle. Mortlock points out how similar it is to the one up the road at Dalham. 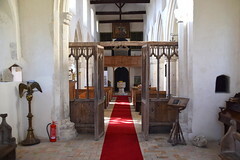 The paleness of the wood is very pleasing.I thought it compared very well with the parclose at Dennington, which has been repainted gaudily. 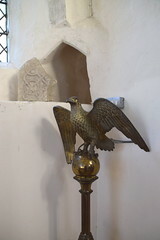 Another good parclose of the same age is at Westhorpe. 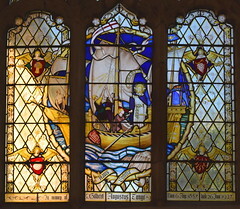 A memorial window contains 1920s glass by Christopher Webb of Christ standing in the boat with the fishermen at Galilee, a pennant of the newly-founded Diocese of St Edmundsbury and Ipswich fluttering at the stern. 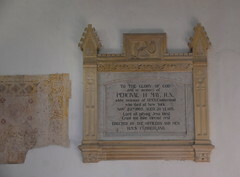 One the wall beside the parclose in the south aisle is a small exposed area of wall painting. It appears to be an unbearded male saint holding something that may well be a chalice, in which case it is St John the Evangelist. 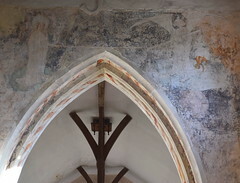 The better-known wall painting here is the one I mentioned earlier, above the chancel arch. This is often referred to as the Cowlinge Doom, but it is organised rather differently to other doom paintings of its kind. Instead of the day of judgement, with God in Majesty overseeing the parting of the ways into hell on his right and heaven on his left, it depicts St Michael, to the south of the arch, balancing a set of scales in which a sinner is being weighed against his sins. 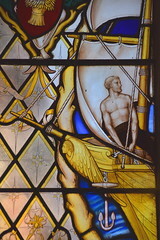 St Michael is a common feature of doom paintings - he appears nearby at Stoke by Clare and on the famous doom at Wenhaston. The unusual aspect of this one, however, is to the north of the arch, where the Virgin Mother of God stands. She reaches out with a wand, and tips the balance of the scales. Simon Jenkins, in his England's Thousand Best Churches, suggests that she is tipping the balance in the favour of the virtuous. This is, of course, exactly what she is not doing. The virtuous had no need of intervention; the good in them would outweigh their sins in any case. Mary is intervening on behalf of sinners who have prayed to her for her help, and she is tipping the scales in the favour of those sinners. It represents the efficacy of intercessions to Our Blessed Lady, and as such it was anathema to the 16th century reformers. In common with other wall paintings, this priceless art treasure was whitewashed over rather than destroyed. It would be interesting to know when this happened. We know that during William Dowsing's iconoclastic progress through Suffolk and Cambridgeshire in 1644, he found no wall paintings still in existence. 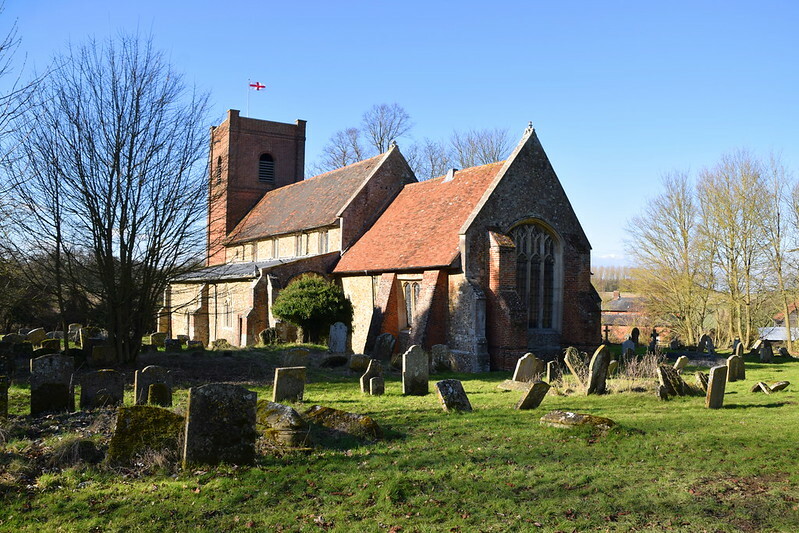 It has always been assumed that they were covered by the Anglicans when the new Church of England took possession of our parish churches a century earlier. But I do wonder if they might have been done away with a century before even that, perhaps around the middle of the 15th century, when the ruling classes were enforcing orthodox Catholic dogma in the face of the superstitions of the ordinary people. Part of this process involved setting up larger roods at the east end of the nave, and I think this wall-painting may have been covered before that happened here. 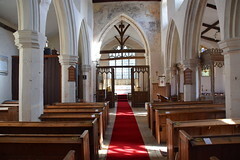 The chancel arch beneath the doom is also extensively painted, and also of interest on all of the pillars a large amount of medieval graffiti, some of which is described as being consecration crosses. This, of course, cannot be so, for the medieval church ordered its liturgical needs rather better than this, and these are no doubt the work of some bored 17th century vandal. 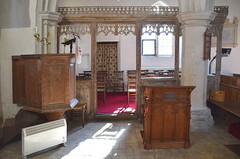 Stepping through into the chancel, it is at once one of the loveliest in Suffolk, and one of the most dominated, since Peter Scheemakers' ugly 18th century memorial for Francis Dickins glowers against the north wall. Dickins was responsible for the building of the tower. 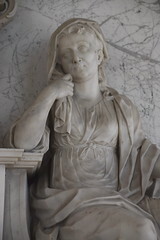 The figures are life size, and the monument is wholly secular, even pagan. 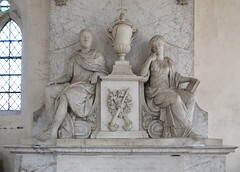 They look like nothing so much as a couple on their way to a toga party pausing to pose with the FA Cup. 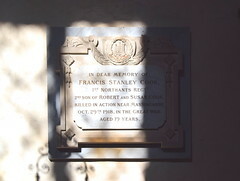 Near the north door, a plaque on the wall records the visitation of 1618 when permission was given for the local house of correction to set up seating here for its inmates. There are still banked benches below, but these are later, and were probably intended for the village schoolchildren. Seating on a similar scale can be seen at nearby Kedington, divided there into boys' and girls' sections. On a somewhat larger scale they can also be seen at Laxfield. A fine view of the interior can be had by climbing to the spacious gallery beneath Dickins' tower. 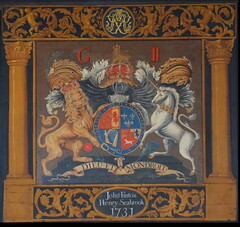 Once up here, the space is dominated by another huge classical memorial to Dickins and above it a George II royal arms, which also records that George Finton and Henry Seabrook were the churchwardens who set it up in 1731. St Margaret is everything a historic church should be. Well-ordered, welcoming, suited to its Protestant present and mindful of its Catholic past. 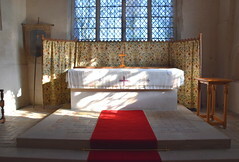 It used to be left open all the time, but a traumatic assault on the building some five years ago by a mentally ill man suffering from a religious mania, during which both screens and the altar were set fire to, means that it is now kept locked, but with a very cheerful churchwarden who was most happy to come and open up.